And that’s it! Phase 3 of the build is now completed, so the studio is now ready for the wiring to be installed, which will be happening early next week. Howard and Jeff sorted out a few details on the phone. The original large panel tabletop had too much mass, risking creating sympathetic resonance, and also making the space under it into a resonant cavity. So Artis chopped even more off the back of it, and added a vertical support underneath to take the weight – the M1F being the heaviest item. 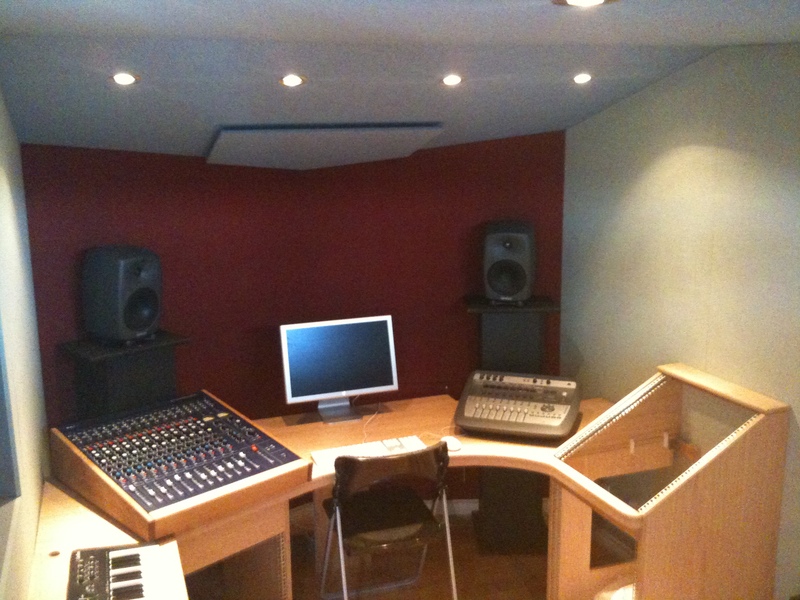 I also learn that all-valve desks have a slight acoustic resonance (being made partly of very thin glass valves) which has to be taken into account in studio design – it’s important to ensure that no sympathetic vibrations make it through to the body of the mixer. 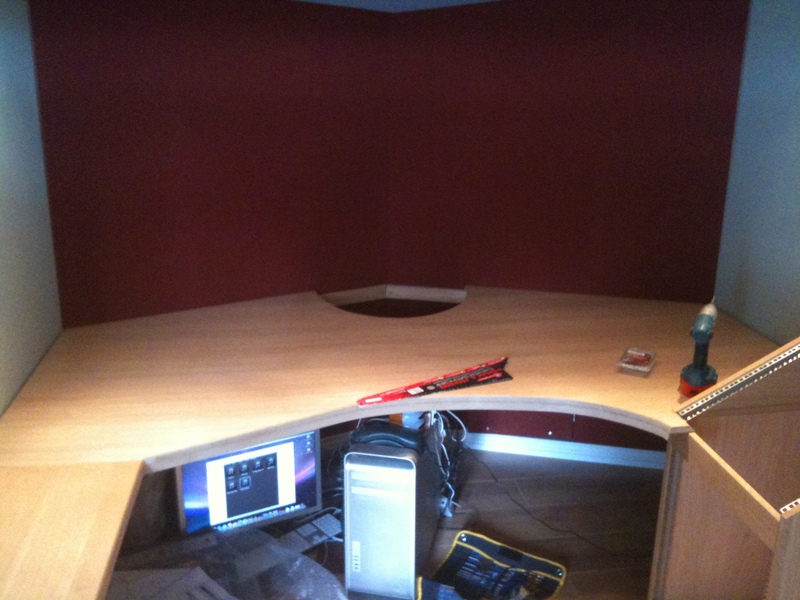 And here's the curved area, with a larger cable hole at the back. 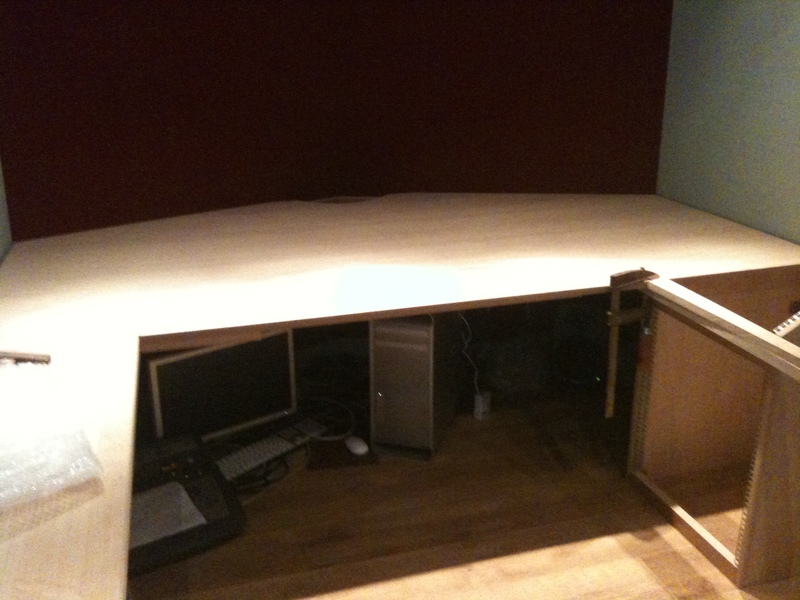 The straighter part on the left is deliberate - it's cut to the width of the M1F desk. Artis is making another standalone rack unit, which I won't need yet, to future-proof the studio in case I get more rack equipment. For now it will sit empty under the M1F. On seeing the photos and videos, Howard still wasn’t convinced that the desktop would be acoustically neutral in the room. 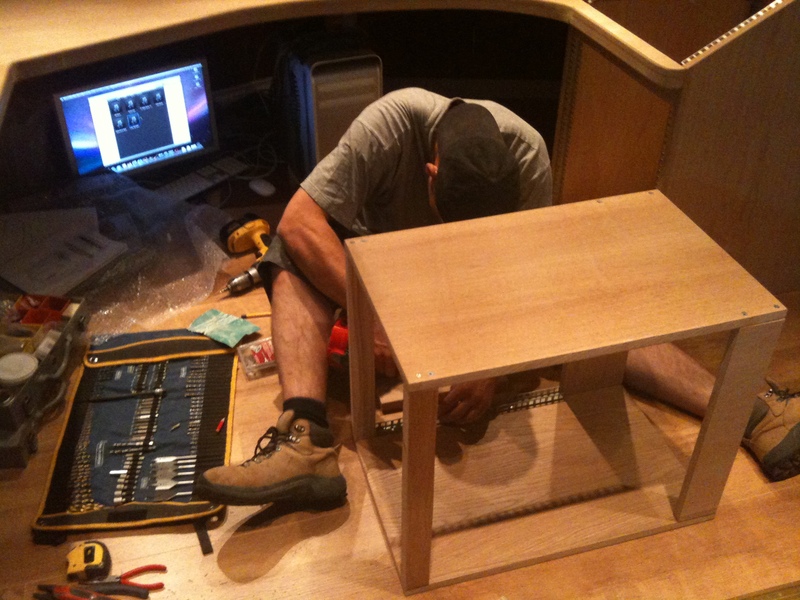 So he phoned through some more info & suggestions to Jeff, who got Artis to cut the desk down even more. The holes in the tabletop were cut to the size of Howard’s speaker stand design. There are various ways of making studio speaker stands (including buying them commercially) but the rule seems to be simply to stand your cabs on something as dense as possible. Artis was telling me that sometimes they just stack concrete blocks then paint them or cover them with hessian. In this case, he’s made tall rectangular vertical wooden ‘boxes’ out of chipboard, which are then filled with sand to provide the density (ensuring no transmission of vibration to the floor or desk). 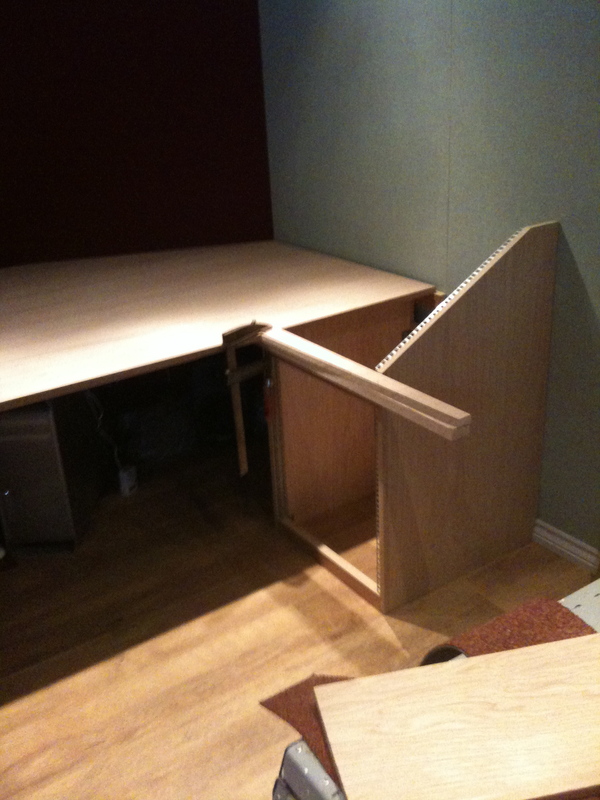 So my tabletop is a completely unique shape that no other studio has – it’s been cut to shape to take account of the M1F, Digi002, over/under rack, and all of course at the right knee height for a short bloke in a swivel chair. They even cut it to ensure the smoothest ergonomic travel for the mouse (so I can’t work with any left handed co-producers!). The final desktop shape and design, with the newly-constructed sand-filled speakers stands in place. Lovely! Now that everything’s in, I can get back to sofa purchasing. The consensus seems to be that ‘wipe-clean’ surfaces are best for studio sofas (euwwww) so I’m on the look out for antique leather ideally – second-hand of course. So if you see anything, send me those ebay links!